Have you ever gotten creative in the kitchen and it just didn’t turn out the way you planned? t started off making this Apple Pecan Maple Sausage Cornbread Stuffing for a turkey. As it turns out I like my good old traditional savory stuffing for a turkey. This stuffing is seriously amazing don’t get me wrong, but I think it would be best paired with a pork tenderloin or some cider glazed pork chops. One of the girls at work even said that she would eat it at breakfast. So think of this as the most versatile Thanksgiving stuffing you’ll ever make breakfast, lunch or dinner its delicious! In a medium skillet brown the maple sausage using your spatula to make it into tiny bits much like you would when making taco’s. One the meat is browned remove from the pan and place in a LARGE mixing bowl. While the sausage is cooking toast the pecans on a baking sheet in a 400* oven for 7-10 min until fragrant. Using the same pan that you just browned the sausage in add the apples, onion, butter and cinnamon. Cook over medium/low heat until the onions are translucent and the apples are tender. 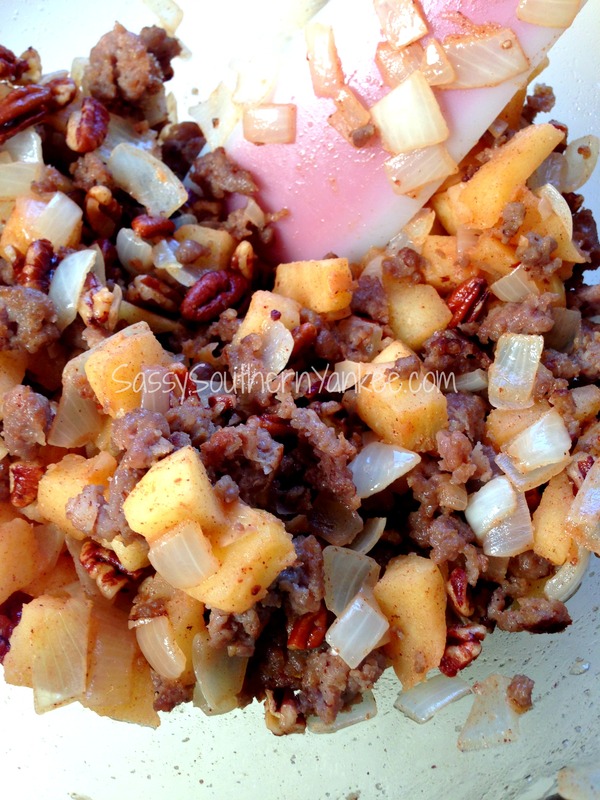 Remove the cooked apple onion mixture, and place it in the mixing bowl with the sausage. Add the sage, rosemary, pecans. Cut the cornbread into bite size pieces and then add to the bowl with everything else. In a small bowl add the eggs and scramble them with a fork then add the apple cider and maple syrup. Pour the mixture over everything in the bowl. Gently toss the cornbread mixture with the eggs until evenly combined. Pour the Apple Pecan Maple Sausage Cornbread Stuffing into a casserole dish and bake at 375* for 3o min until golden brown. 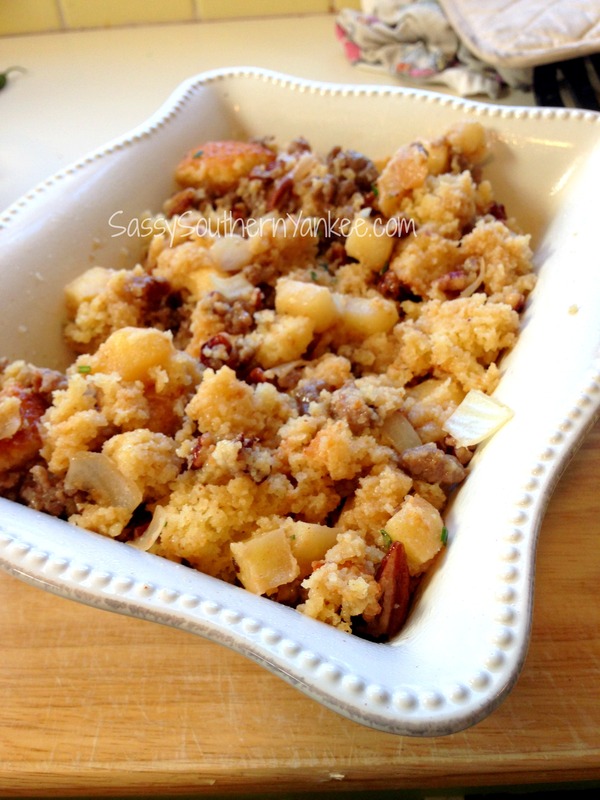 Apple Pecan Maple Sausage Cornbread Stuffing the most versatile Thanksgiving stuffing you'll ever make breakfast, lunch or dinner its delicious! In a medium skillet brown the maple sausage using your spatula to make it into tiny bits much like you would when making taco's. One the meat is browned remove from the pan and place in a LARGE mixing bowl. 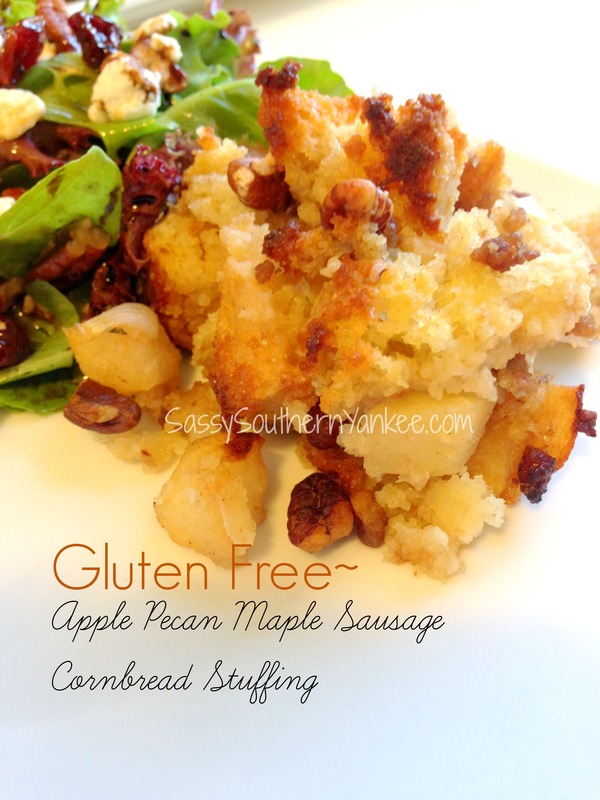 This entry was posted in Main Course, Side Dish and tagged Apple, Breakfast bake, Comfort Food, Cornbread, Dressing, Gluten Free, Maple Sausage, Pecan, Stuffing, Thanksgiving. Can the sausage portion be made the a head of time and mixed with the bread and egg mixture later before going into the oven? Yes! In fact that is exactly what I have done tonight. It makes for an easier Thanksgiving day. Happy Thanksgiving! Hi there! My name is Jessica! Welcome to my blog! VP of HR by day, Gluten Free Blogger by night, Boxer Mommy to Lexi, Coffee Lover and Book Nerd. Sassy Southern Yankee is Just a Little Bit of Everything~ Recipes, Fitness, and Projects.